Uh-oh! Your air conditioning unit has stopped working, it’s making weird sounds, and/or you simply saw the title of this blog and have been reminded of that little box that’s been sitting outside of your house for the last decade. Whatever the reason for you reading this blog, we are here to inform you of the seven signs it’s time for an A/C replacement. 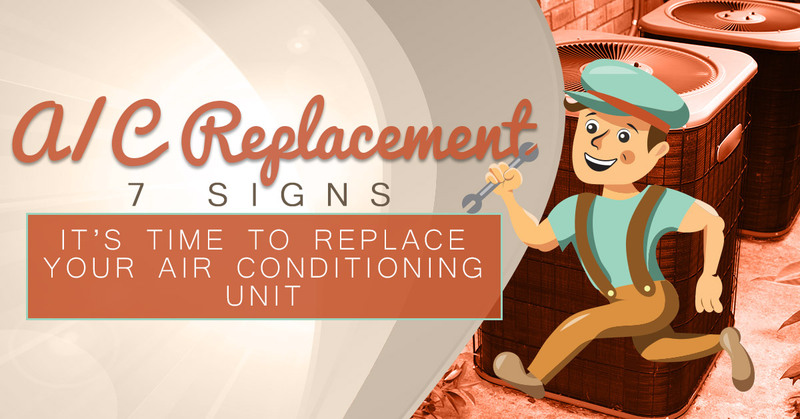 First and foremost, if you are reading a blog about signs it’s time for an A/C replacement, it is most likely because, yes, you need an A/C replacement. If you are concerned your A/C unit may be “running on it’s last leg,” contact us at Comfort Pros Heating and Cooling in Lee’s Summit today and we can help you determine if an A/C replacement is the best option for you. There are many reasons why your A/C unit may stop working— tripped circuits, blown fuses, and dirty filters are common reasons why your A/C unit may abruptly stop working, but if nothing seems to be working improperly and you’ve had an HVAC professional look at your A/C unit recently, it may be time for an A/C replacement. Is your A/C unit squealing, screeching, clanking, clicking, or rattling? Have these sounds significantly increased in noise recently? These sounds are not normal and may indicate you need an A/C replacement. Do you know the HVAC repair company’s phone number by heart? Feel like you are constantly making appointments with them? The truth is, you are probably spending more money on HVAC repairs than your unit is worth. If your A/C unit is no longer under warranty, call a professional to help you determine if your A/C unit is worth repairing, or if an A/C unit replacement is best. Is the task of opening your utility bill each month like opening a box of chocolates— you never know what you’re gonna get? If your energy bills are rising for no apparent reason, your A/C unit may be to blame. Old, malfunctioning A/C units use more energy, thus causing you to have to write a bigger check. You may want to look into getting an A/C replacement. Your home should be warm from love, not an inefficient A/C unit. Are you noticing you’re having a hard time cooling your home? Or that some rooms are hotter and colder than others? This could be because you’re A/C unit is the incorrect size for your home or because your A/C unit is old and faulty. Whichever the reason, it may be time for an A/C replacement. In general, you can expect a well-maintained A/C unit to last you around ten years. If you are lucky enough to have just been reminded that you’ve had an air conditioner sitting behind your house for the last decade, with no problems, it would still be a good idea to look into an A/C replacement. Every year technology improves and chances are it will cost you less to purchase a brand new and more efficient A/C unit than to continue to pay for an inefficient and costly A/C unit. If you are in the Lee’s Summit area and think it’s time for an A/C replacement, or you’d like to discuss your options with an HVAC professional, contact the HVAC specialists at Comfort Pros Heating & Cooling today! We look forward to helping you.